Hello my fellow travelers!! How exciting, I came across this web story today that I had to share: Ten ways to Travel very Cheaply (by Donna Freedman, July 04, 2011, http://msn.com/). It's informative and information I eventually would have blogged about. In addition to that, I wanted to share some statistical information about this website. Blogger.com keeps a log of the stats on my blog. They're complete with graphs, charts and percentages (all for free). I can check: "now, daily, weekly, monthly and all time" on things like "Overview, Posts, Traffic and Audience". I love following the stats mainly for two reasons. One, because I'm curious to see who and from where. And second, because every time I check I am more astonished by what I see. This Friday (the 8th), will mark the four month anniversary of when I started to bring you along on my travel adventures. I am humbled, surprised and excited at how much support and interest you have shown. I have posted a total of 15 blogs thus far (I try to post once per week). Those posts have been opened in 20 countries around the world and collectively viewed a total of 4001 times. I thank you. While I have met a few of you from some of these places, I don't have my own friends in each Country listed (not yet anyhow). Thank you for sharing with your friends, I hope they're loving the adventure too!! For anyone wishing to share the link, I tried to write a caption that you could 'copy & paste' but a good friend of mine wrote a far superior version on my behalf. 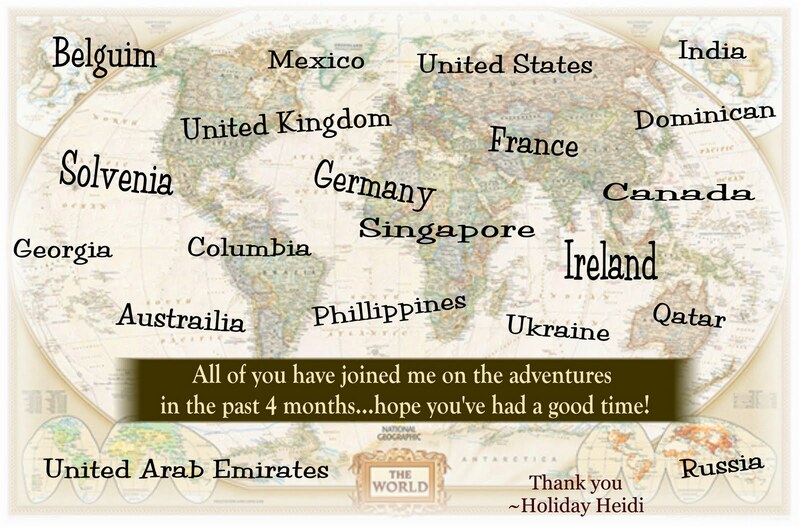 "I know this crazy adorable woman called Holiday Heidi who works 3 jobs (very competently) so she can travel, and upon return share her adventure with us. She is a compelling writer who adds pictures and videos to help carry the story. We ...all need to meet her dozens of new friends from each trip because she is a strong cord in the knitting that wraps our fragile world together. Oh - and her blog is a 7 minute mini-vacation - just go!" It's simple. I love people, travel, work and writing. And I have supporting, loving and amazing family & friends ... thank you. I will continue to write ... it's fun to know that you're packing your bags and coming with me! Feel free to answer this weeks' weekly survey question, leave a comment and/or send me an email: holidayheidi@hotmail.ca. Always check if you have all the necessary documents needed when traveling. Get yourself a kit just so you wouldn't miss anything.